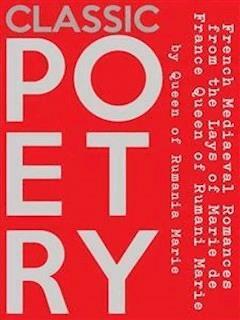 The lais of Marie de France are a series of twelve short narrative Breton lais by the poet Marie de France. They are written in the Anglo-Norman and were probably composed in the late 12th century. The short, narrative poems generally focus on glorifying the concept of courtly love through the adventures of their main characters. Despite her stature in Anglo-Norman literature and medieval French literature generally, little is known of Marie herself, though it is thought that she was born in France and wrote in England.Marie de France's lais, told in octosyllabic, or eight syllable verse, are notable for their celebration of love, individuality of character, and vividness of description – hallmarks of the emerging literature of the times. Five different manuscripts contain one or more of the lais, but only one, Harley 978, a thirteenth-century manuscript housed in the British Library, preserves all twelve. It has been suggested that if the author had indeed arranged the Lais as presented in Harley 978, that she may have chosen this overall structure to contrast the positive and negative actions that can result from love. In this manuscript, the odd lais — "Guigemar", "Le Fresne", etc. — praise the characters who express love for other people. By comparison, the even lais, such as "Equitan", "Bisclavret" and so on, warn how love that is limited to oneself can lead to misfortune.The Harley 978 manuscript also includes a 56-line prologue in which Marie describes the impetus for her composition of the lais. In the prologue, Marie writes that she was inspired by the example of the ancient Greeks and Romans to create something that would be both entertaining and morally instructive. She also states her desire to preserve for posterity the tales that she has heard. Two of Marie's lais – "Lanval," a very popular work that was adapted several times over the years (including the Middle English Sir Launfal), and "Chevrefoil" ("The Honeysuckle"), a short composition about Tristan and Iseult – mention King Arthur and his Knights of the Round Table. Marie's lais were precursors to later works on the subject, and Marie was probably a contemporary of Chrétien de Troyes, another writer of Arthurian tales. The corporate life of a mediaeval household centered in the hall. It was office and dining and billiard room, and was common to gentle and simple alike. The hall was by far the largest room in the house. It was lighted by windows, and warmed by an open fire of logs. The smoke drifted about the roof, escaping finally by the simple means of a lantern placed immediately above the hearth. A beaten floor was covered by rushes and fresh hay, or with rugs in that part affected by the more important members of the household. The lord himself and his wife sat in chairs upon a raised daïs. The retainers were seated on benches around the wall, and before them was spread the dining table—a mere board upon trestles—which was removed when once the meal was done. After supper, chess and draughts were played, or (as we may see in “The Lay of the Thorn") minstrels sang ballads and the guest contributed to the general entertainment by the recital of such jests and adventures as commended themselves to his taste. If the hall may be considered as the dining room of the mediaeval home, the garden might almost be looked upon as the drawing room. You would probably get more real privacy in the garden than in any other part of the crowded castle, including the lady’s chamber. It is no wonder that we read of Guenevere taking Launfal aside for a little private conversation in her pleasaunce. It was not only the most private, but also the most delightful room in the house—ceiled with blue and carpeted with green. The garden was laid out elaborately with a perron and many raised seats. Trees stood about the lawn in tubs, and there was generally a fountain playing in the centre, or possibly a pond, stocked with fish. Fruit trees and flower beds grew thickly about the garden, and a pleasanter place of perfume and colour and shade it would be difficult to imagine in the summer heat. The third room of which we hear continually in these romances is the lady’s chamber. It served the purpose of a boudoir as well as that of a sleeping room, and consequently had little real privacy. It contained the marriage chest with its store of linen, and also the bed. This bed recurs eternally in mediæval tales. It was used as a seat during the day, and as a resting-place of nights. It was a magnificent erection, carved and gilded, and inlaid with ivory. Upon it was placed a mattress of feathers, and a soft pillow. The sheets were of linen or silk, and over all was spread a coverlet of some precious material. An excellent description of such a couch is given in “The Lay of Gugemar.” This chamber served also as a bath room, and there the bath was taken, piping hot, in the strange vessel, fashioned somewhat like a churn, that we see in pictures of the Middle Ages. Those to whom God has given the gift of comely speech, should not hide their light beneath a bushel, but should willingly show it abroad. If a great truth is proclaimed in the ears of men, it brings forth fruit a hundred-fold; but when the sweetness of the telling is praised of many, flowers mingle with the fruit upon the branch. According to the witness of Priscian, it was the custom of ancient writers to express obscurely some portions of their books, so that those who came after might study with greater diligence to find the thought within their words. The philosophers knew this well, and were the more unwearied in labour, the more subtle in distinctions, so that the truth might make them free. They were persuaded that he who would keep himself unspotted from the world should search for knowledge, that he might understand. To set evil from me, and to put away my grief, I purposed to commence a book. I considered within myself what fair story in the Latin or Romance I could turn into the common tongue. But I found that all the stories had been written, and scarcely it seemed the worth my doing, what so many had already done. Then I called to mind those Lays I had so often heard. I doubted nothing—for well I know—that our fathers fashioned them, that men should bear in remembrance the deeds of those who have gone before. Many a one, on many a day, the minstrel has chanted to my ear. I would not that they should perish, forgotten, by the roadside. In my turn, therefore, I have made of them a song, rhymed as well as I am able, and often has their shaping kept me sleepless in my bed. In your honour, most noble and courteous King, to whom joy is a handmaid, and in whose heart all gracious things are rooted, I have brought together these Lays, and told my tales in seemly rhyme. Ere they speak for me, let me speak with my own mouth, and say, “Sire, I offer you these verses. If you are pleased to receive them, the fairer happiness will be mine, and the more lightly I shall go all the days of my life. Do not deem that I think more highly of myself than I ought to think, since I presume to proffer this, my gift.” Hearken now to the commencement of the matter.